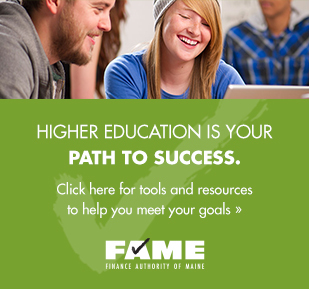 Maine‘s economy in the next decades depends on a highly educated workforce, and instilling aspirations for higher education begins at an early age. Use the resources below to help the families in your community prepare for higher education. If you have a parent or other family member or friend who wants to open a NextGen 529 account for a child, consider offering to make the required initial contribution. It only takes $25 (and if you are, or your beneficiary is, a Maine resident, the account may receive a $200 Initial Matching Grant, if eligible). Learn more about how FAME can help families in your community save for college, learn about financial aid and manage your student loans after you’ve graduated. Share FAME’ free publications. Order from FAME’s website.